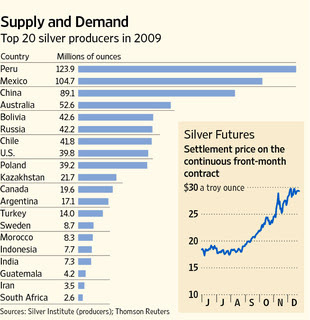 If you are new to the miracle of silver, the WSJ has a nice piece on one of the hottest commodities of 2010. [Commodity-palooza - Year to Date Returns in the Commodity Complex] Silver has a combo bet going on - it is part precious metal so an alternative currency like gold (a place for people to flee the antics of central bankers and their effects on fiat money), and part industrial metal so it benefits from good vibes from the global economy ala copper. And like many commodities it has been 'financialized' over the past decade so much easier for large swathes of money to move in (and out) of. Hence true physical supply and demand apparently means very little... see oil for much of mid 2009+ and almost all of 2010. When the hot money starts to abandon ship, I expect a very ugly ending here... but it could be years away. While I get antsy seeing so much attention being a contrarian, the time to be very fearful is when you see silver on the front page of Money Magazine, Kiplinger's or indeed something like USA Today. For now, it's only yellow flag time. An unexpected surge in investor demand is sending silver prices soaring—and speculators and mining companies are digging in. In the past four months, the metal has upended forecasts, rising 51% to a series of 30-year highs, before inflation. Silver closed Thursday at $29.31 a troy ounce, up from $16.822 at the beginning of 2010. Gold, by contrast, is up 26%. Prices are rising despite oversupply and a lackluster recovery in industrial demand. Many analysts expected those factors would keep a lid on prices in 2010. What they didn't expect was an overwhelming flow of money into the market from investors eager to ride a commodities rally. "This is a story almost entirely about investment," says Stephen Briggs, senior metals strategist at BNP Paribas. Exchange-traded funds backed with silver have enabled investors to invest in a market that traditionally was harder to participate in. The largest silver ETF, the $10.2 billion iShares Silver Trust, has seen a $1.1 billion net inflow for the first 11 months of this year. In recent months, concerns about inflation, the European debt crisis and the U.S. Federal Reserve's recent moves to boost the economy have driven investors to hard assets, also benefitting silver prices. The global silver appetite partly reflects world economic improvements. Investors from the U.S. to China turned to "hard" assets such as copper and other commodities in part as a hedge against inflation worries. Silver benefits from a dual role as industrial commodity and precious metal. The craze has reached the coin market. In November, silver American Eagle coins sold by the U.S. Mint amounted to 4.26 million ounces, a monthly record in the agency's history. Silver's reliance on investors to prop up the price could cause it to tumble suddenly. "When investor support for the metal fades, the downside is going to be pretty substantial," says Credit Suisse analyst Tom Kendall. He forecasts an average price of $30.10 per troy ounce next year as "a lot of factors that have led people to buy silver would still be there in 2011." But he cautions, "The number is only going to be achievable as long as fresh money keeps moving in." While $30 seems high, in inflation adjusted terms it still has a long way to go to reach old highs. Of course there was the little issue of the Hunt Brothers cornering the market... then again we now have the JPMorgan brothers, who unlike the Hunt clan is backstopped by the U.S. government (TBTF) and Federal Reserve. Silver's all-time high was set in January 1980 at $48.70 an ounce, or $129.32 when adjusted for inflation. The strength in silver prices has prompted a flurry of development around the globe and pushed anticipated production in 2010 to 733.2 million ounces, up 3.3% from 2009 levels, and up 14% since 2006. Concerns are lingering over excess supply. The market is set to see a surplus of 64.4 million ounces in 2010, says Barclays Capital, which could curb prices. Silver has some inherent appeal due to its industrial use in electronics, silverware and coins. And reserves are limited. According to the U.S. Geological Survey, there are fewer years of U.S. silver production left in the ground than any other precious metal including gold. Next on the docket in the "financialization of commodities" appears to be copper... so yet another metal that should skyrocket for reasons that have little to do with actual usage, indeed institutional money already seems to be front running the 2011 physical ETFs in the pipeline.